Is it possible to save submitted form submissions to add as attachements? 1. Once the forms are submitted, is there a way to save them as PDFs and used as attachments? 2. Once the info is submitted, is the info saved in a spreadsheet that can be manipulated or exported into Excel? 3. Can you set up scheduled reports to go out to certain people with certain criteria of the submitted information? 4. The forms that are submitted, is there way to make multiple distinct pages for one person so that they're not having to submit 6 different times? I am looking forward to hearing from you and hopefully we can start using JotForms for our registration completion. From what I am seeing here you have several questions for using our form service so we'll start with the first one about using pdf's since we ask that you please only ask one question per thread. You're asking about once forms are submitted if there's a way to save them as pdf to use as attachments. 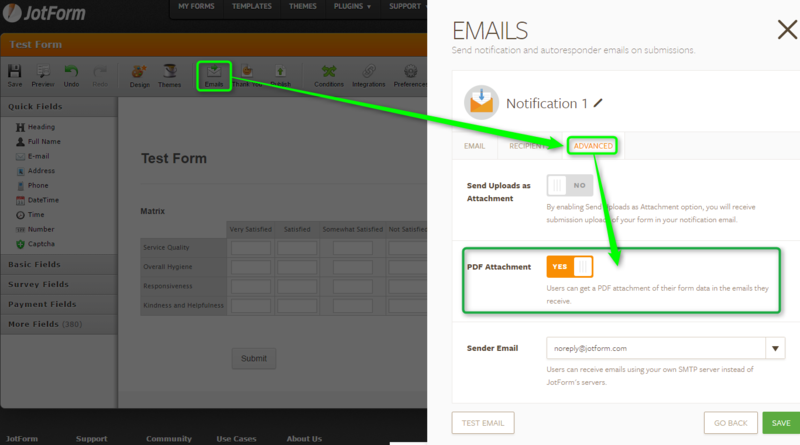 To do this simply enable the attached pdf feature for it in your email and/or autoresponder. As for your other questions, I have split those into new threads below to answer individually.